Place the buttermilk, 1/2 tsp. black pepper, salt and cayenne pepper in a large re sealable plastic bag. Add the Chicken, seal and shake to coat. Chill for 30 minutes or up to 2 hours, if possible. Place the flour, paprika, mustard, garlic salt and remain pepper in a separate bag. Add 1 Chicken piece to the bag, close and shake to coat your chicken. Transfer to a plate or wire rack. Repeat with the remaining chicken pieces. 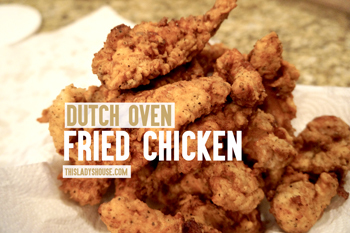 Preheat your 12″ deep dutch oven. You just want it warm so that you can put the fried chicken in to keep warm. You may want to put a paper towel or so in the bottom to take up any grease off the chicken. Heat your cast iron skillet to 350 degrees with vegetable oil. Add your chicken pieces to your skillet…..not too many now 3 to 4 pieces depending on what you are frying. Reduce the heat and cover and cook for 10 minutes. Turn the chicken over and cook, uncovered, until the juices run clear when the chicken is pierced with a knife, about 10 minutes longer, Drain the chicken on a paper towels. Transfer to the 12″ Deep Dutch Oven. Repeat the steps for frying and draining for the remaining chicken pieces. You want to serve your Chicken Hot!!! This entry was posted in Recipe and tagged Dinner, Poultry.